The Huawei Ascend P2 finds itself between a bit of a rock and a hard place. It has impressive specs and a decent price, but it's supposed to be going head to head with the likes of the Samsung Galaxy S4, HTC One and Nokia Lumia 925. They're better. So what's the world's fastest smartphone? The Samsung Galaxy S4? HTC One? iPhone 5? Wrong, wrong and wrong - if you're talking about mobile data speeds the Huawei Ascend P2 is the unlikely hero stealing the crown. The reason the Ascend P2 lays claim to the world's fastest title is due to the Cat 4 LTE innards it sports, which can provide a theoretical speed of up too 150Mbps, but you're never going to actually see that. With 4G baked inside the handset you can expect EE will be picking up the Ascend P2 pretty quickly in the UK, although we're yet to see any network commit to Huawei's latest flagship smartphone just yet. You can pre-order the Huawei Ascend P2 with some online retailers, with the SIM-free handsets setting you back around £339.99 (around $530, AU$560), and we reckon this will probably translate into around £25 per month on a 3G contract. Huawei has a bit of a reputation for being a budget phone merchant and the Ascend P2 is the Chinese firm's latest attempt at changing that assumption - and let's hope it does better than the Ascend P1 which arrived in stores with nothing more than a whimper. In terms of competition the Ascend P2 doesn't enter at the top of the smartphone tree, with the likes of the Galaxy S4, iPhone 5 and Sony Xperia Z all offering a more premium - and expensive - experience. 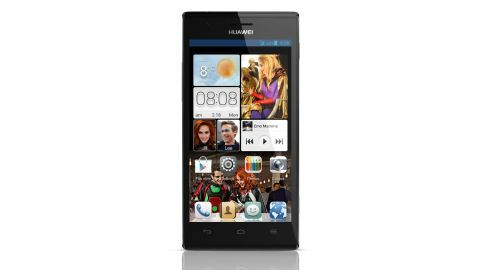 The Huawei Ascend P2 will find itself rubbing shoulders with the mid-high level of handsets which include the Sony Xperia SP, Samsung Galaxy S4 Mini, Nokia Lumia 820 and even the Samsung Galaxy S3. However it's also got one of its own kind to contender with too in the form of the Huawei Ascend P6 - a super-slim smartphone which may not have such a blockbuster camera, 4G connection or as large internal storage, but it does sport a far more attractive design and it's difficult to see how the Chinese firm will be able to market both successfully side by side. On paper the Ascend P2 looks relatively good value for money with a 4.7-inch, 1280 x 720 display, 1.5GHz quad-core processor, 1GB of RAM, 16GB internal memory, 13MP rear camera and front facing 1.3MP snapper. Jelly Bean is the operating system of choice on board and along with the likes of 4G and NFC, Huawei has managed to make the Ascend P2 a compact 136 x 67 x 8.4mm, and the lightweight plastic body tips the scales at 122g. In terms of design the Ascend P2 doesn't exactly break any new ground, but it's a relatively stylish, functional handset which sits reasonably well in the hand - although we found it offered little in the way of grip which lead us to worrying about dropping it, and sometimes actually dropping it. Whoops. We're told though the back cover (which isn't removable by the way) on our review isn't the same as the one which will find its way onto the P2 which you'll be able to pick up from stores, so hopefully it will offer a bit more grip. As you can't peel off the back cover there's no access to the 2420mAh battery housed inside the Ascend P2, which explains why the SIM-port is located on the right side of the handset under the easily accessible power/lock key. The microSIM port itself is covered by a plastic flap which isn't too tricky to flip open, although popping your SIM in and out is more of a challenge and unless you have some decent length in your nails you'll need to use the little tool included in the box to manipulate the card. An added bonus on the right hand side of the Ascend P2 is the inclusion of a dedicated shutter key towards the base of the handset, giving you instant access to the camera app as well as an easy way to snap photos. Up top there's a headphone jack and a microUSB port, which keeps the bottom of the Huawei Ascend P2 clear for the sweeping black, glossy plastic finish. On the left you get the customary volume rocker switch and moving round the back reveals a camera lens and single LED flash housed in a textured metal frame for a bit of added protection, plus there's a dual speaker grille near the bottom of the handset. Available in both white and black the Huawei Ascend P2 is a solid, well built, if not slightly uninspiring handset which won't look out of place next to its competition.